Reading this excellent reflection on the Twilight: Breaking Dawn 1 movie got me all riled up again about why I dislike Twilight, and since it wasn’t posted on this blog, I re-post for your reading enjoyment my August 2009 review of the Twilight series as compared with the Harry Potter series (medium-grade spoilers for both ensue). Overall, I am hugely unimpressed with the Twilight saga, and baffled that it is so often compared to Harry Potter. This seems to me the way my parents were baffled when The New Kids on the Block were compared to the Beatles. Sensation-causing boy band? yes. Legend reshaping music for all time? not so much. Did Stephanie Meyer and her saga make a splash in the YA fantasy genre? yes. Was her work creative, well-written, or life-changing? no. Say what you will, doubters, but JK Rowling created a world unlike any other, with talents and vocabulary– and sports even– unlike anything we’d ever imagined. Her characters, although she sold some of them short (like Snape, and Sirius and Remus), were multifaceted and identifiable. In her world, girls found role models in strong and heroic women– Hermione’s brilliance and courage which never made her unattractive, Ginny’s determination, Luna’s originality, Molly’s maternal force-of-nature, McGonagall’s wisdom, Tonks’– yeah, I dunno about her; I don’t really like Tonks (she’s a little– Bella– to me, plus, she stole her cousin’s man). Boys found role models, too, in Harry, of course, but also in the just-as-idolized cast of secondary male heroes: Ron’s loyalty which never–okay, once–wavered, Neville’s bravery that takes you by surprise at first, Remus and Sirius in their father-stand-in roles, Dumbledore’s brilliant and humorous mentoring, Snape’s redeemability that people somehow doubted, Fred and George’s humor and levity and loss of innocence. Rowling’s message, ultimately, is in the triumph of love of friends and family and romance and the world around you, over the forces of evil and death, no matter how dire. She wrote of love that leads to sacrifice, redemption, and transformation, and she consistently taught that the heroes are not always the people we expect, not always the strong or the beautiful or the famous, but sometimes also the Nevilles and Lunas and Hagrids and Snapes of the world. Her message, when summed up and placed in the hands of children, is something like this: be yourself, because there is beauty and strength in that; follow your heart, love with all you’ve got, and you can overcome the horrible things that are sometimes part of this otherwise beautiful, magical world. Stephanie Meyer also believes in the power of love. But she believes in love between two people, and only two people, and for all time two people. Everyone has to find their mate, their perfect pair, and then that sets everything right. In fact, this is so important, that she makes it literally impossible for any of the main characters to *not* be in love with someone. The Cullen family is not complete until Edward has his Bella, and Carlisle was willing to go to great lengths in his younger days to try to accomplish this. The werewolves not only fall in love, but *imprint* so totally that they are not *capable* of choice beyond that imprint. This is what Meyer thinks love is– not a choice, not an effort, not a journey. It is a moment when you imprint– really, are Bella and Edward any different than the werewolves in this?– when you see the object of your forever affection, and you are hooked. Object is a good word there. Stripping love of the choice, the work, the journey, also strips the individuals in love of their personhood. They are objects to each other. They do not grow, they do not change. They are frozen in time. They are crystalline, shatterproof, hard and flawless, like diamonds. They are to be admired, by one another, for eternity. This seems pointless to me. I don’t quite know what it is, but I don’t think it’s love. In their perfection, they are interesting. Regular humans, you see, particularly the girl humans like Bella, are uninteresting. Bella has no redeeming qualities, no strength, no beauty, no confidence, no talent whatsoever in her mortal life. Only Edward sees value and beauty in her, mostly in the way she smells. 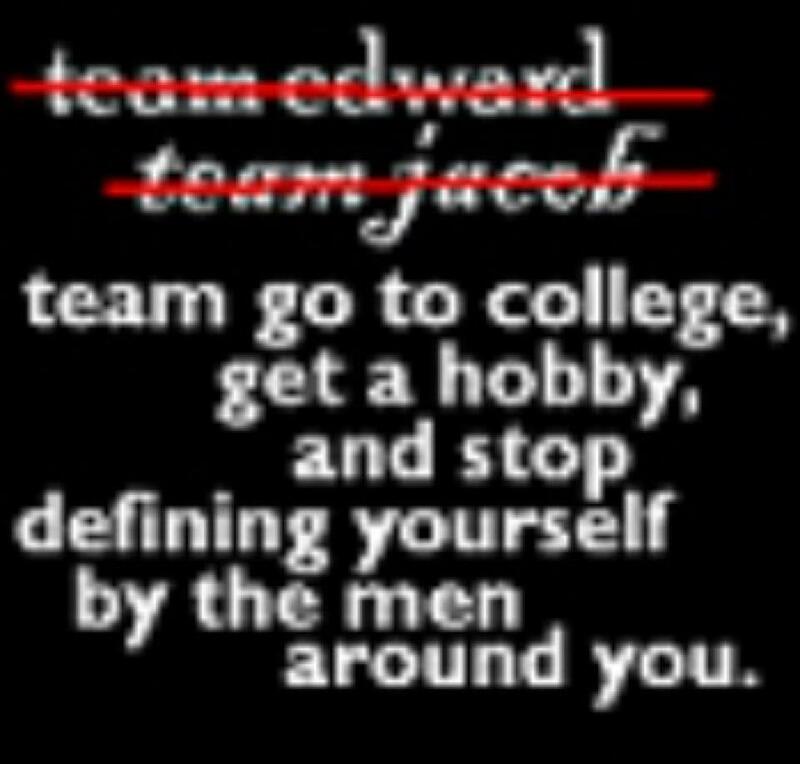 She defines herself by the males around her: by Charlie, Jacob, and Edward, and toward the end of that existence, by the child she carries who is Edward’s. As an immortal, Bella is strong, beautiful, and possesses a talent that mystifies and impresses. She is also totally defined by her role as a wife and a mother. An object. This is so contrary to say, ordinary, shy little Neville, finding the courage to stand up to his friends in the first Harry Potter book, and to stand up to his enemies, most dramatically, by the fifth. That change in Neville is maturity, growth, something the young reader can aspire to. The change in Bella is wrought by Edward– by his presence as much as his venom– and either way, to me reinforces that she is weak and uninteresting until he comes into her life, that the strength she finds has nothing to do with her own self, but with the conditions and the creatures around her. I read the Twilight books, as I read so many things, to see what all the fuss was about, and to see if I would recommend them to my child, and to my friends’ and congregants’ children. I don’t get the fuss, and don’t recommend the books because I don’t find them well-written or interesting. But that’s not the extent of my criticism. I recommend *not* reading the saga, because I think it teaches young women particularly (who are the target demographic) a negative message, ingrained in our culture, and in no need of reinforcement. I think it teaches that girls are dull, powerless, and without talent, that the only thing to which they can aspire is to be loved by a man (or more), and to be worthy of his affection and somehow hold on to him forever. It teaches that love finds its pinnacle in romantic love, which is about perfection and pairing off (at the climax of the last book, Bella observes people expressing love and farewell in the face of almost certain death. What does she see? couples kissing. even though there are friends and parents and siblings and children, the love that people cling to is *only* the romantic love). It teaches that while love may conquer the evils of the world, it also conquers you, stripping you of choice, of change, of self. Ultimately, then, love is not love, but another form of control, another way to define and be defined by the people around us, a thing to freeze in time rather than journey with. A far more demonic message, if you ask me, than any terror a horde of vampires could concoct.